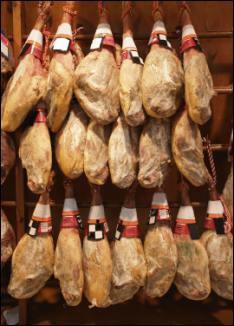 Spanish Ham or Jamon is always first on the list when it comes to Spanish likes or "gustos" as they are known in Spain. Whilst most people find their first encounter with sliced Jamon to be a strange experience the simple yet rich taste quickly grows on them. One curious fact is that Jamones (thats the cured pig leg) are now one of Spains fastest growing exports and making inroads into popular gastronomic culture in both the USA and the far East. 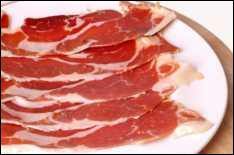 For anyone encountering Spanish Ham for the first time its a some what confusing experience. How can two almost identical jamones, at least from the outside, have wildly differing tastes and textures? Not to mention the pricing! Conforted by a whole hind leg of a pig and at a loss as to where to begin cutting Jamon? Don't worry, our guide shows you how Spanish natives prepare their ham, slice it and even how to store it in both the traditional and modern way. Doesn't look so a great a challenge now does it? Whilst delicious on its own Jamon can be combined effectively with both sweet and sour tastes with startling effect. But best of all, this can be done in just a matter of minutes! Try our FREE recipes that come direct from natives of Spain!